One of the many extravagant displays seen at the march, preceded by a sign written in Spanish that reads: “Defend our mother earth.” Photo by Evan Kreager. 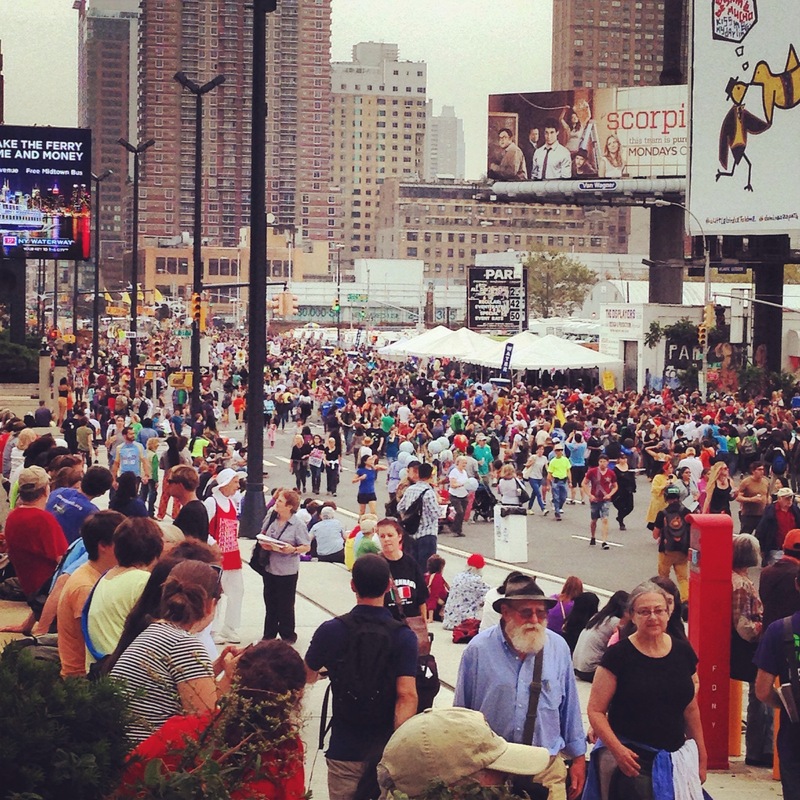 On Sept. 21, the streets of New York City were flooded with upwards of 300,000 people. The mass of participants made history with the largest climate march to date. The People’s Climate March took place just days before President Obama and world leaders attended a climate summit in New York City. The march was a call to action by people who demanded to be heard. Dozens of Ohio University students and Athens community members made the trek to stand for what they believe in. Members of several campus organizations such as Bobcats Beyond Gas, OU Student Sierra Coalition, Student Senate and numerous others were among the locals who attended. 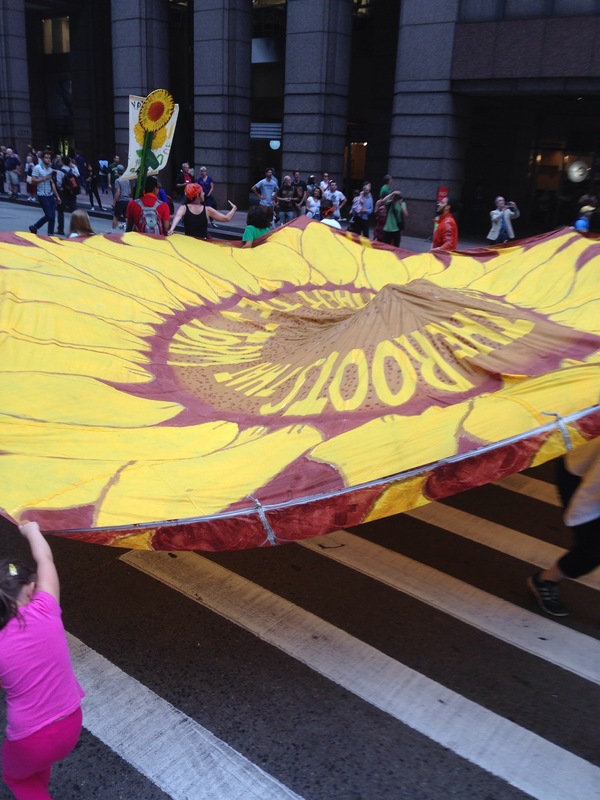 Activists carry a sunflower parachute as they walk the streets of New York. Photo by Evan Kreager. Caitlyn McDaniel, a senior studying war and peace, attended the march to support the issues of climate change and harming the environment. “At the rate that we’re going, we are going to hit so many benchmarks and climate change that we won’t be able to come back from,” McDaniel said. McDaniel asserted that fossil fuels are the No. 1 pollutant in the US and that the blame lies at the feet of corporations. She took an active role in acting against the natural gas plant that was scheduled to be situated near campus. “We are chained to this polluted fossil fuel industry,” McDaniel said. Evan Kreager, a Michigan State University graduate, also attended the march. The goal of the march was to “get as many bodies in the street as possible to grab their attention to do something about climate change,” Kreager said. The march was set to begin at 11:30 a.m. on Sunday and lasted an estimated six hours. When individuals at the front had finished the march, those in the back of the line still had yet to start. Marchers were split into different contingents to allow those with common interests to build networks as they marched. The march effectively joined people from all walks of life together to address one common issue. “It was an outcry of the people to take action and end climate injustice,” Oliver said. 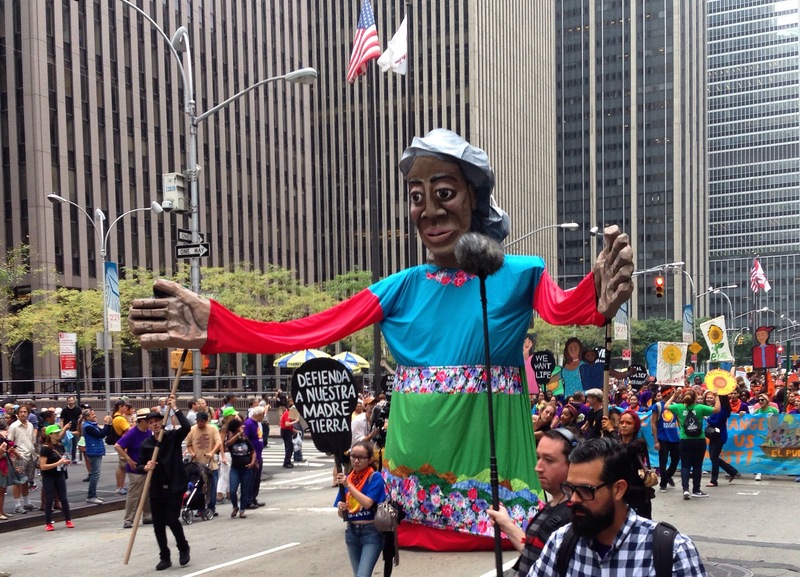 The streets of the Big Apple fill as the People’s Climate March proceeds. Photo by Evan Kreager. One day after, the march activists participated in the civil disobedience sit-in, #FloodWallStreet. Several thousands of people participated in the sit-in as an act of protest to shut down Wall Street. Seeing such a large number of people march for the climate served as a wakeup call for Oliver. Although climate debate and injustice may continue, the People’s Climate March undoubtedly caught the attention of President Obama himself. “Our citizens keep marching; we cannot pretend we do not hear them. We have to answer the call,” said President Obama. The activists set out with a call to action, and President Obama has asserted that it must be answered.